And it's still paying the price. (HT @julesmattsson). So here's a customer complaint being dealt with a few days ago. Nothing remarkable here. Except – things are beginning to escalate. And now the company's starting to give out social media advice, which is a bit weird. Just a suspicion, but not sure Greater Anglia's social media managers quite get how Twitter works. Or indeed, what "trolling" is. This is a train company's Twitter account threatening to block someone. Guess what? Now a whole load of other people, including parody accounts, have joined in. Bet no one saw that coming. Still, at least it wasn't a letter this time. 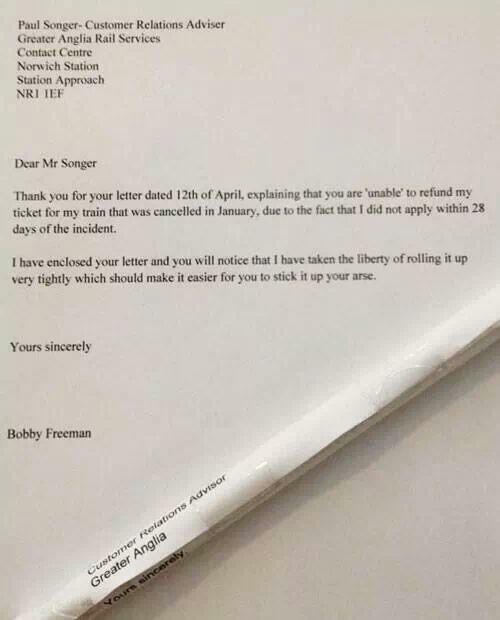 Great complaint letter to Greater Anglia!